Princess Gwen, second in line to the throne of Ituria, has given up on happy endings. After a neighboring kingdom's heir stole her heart and then disappeared four years ago, she buried her heartache and vowed to serve her eleven sisters. Her most recent mission: to arrange a match with her sister Hazel and the lost heir's youngest brother. But when her traveling party is ambushed, her flight from danger leads her into the path of a blindfolded man with a familiar smile. Imprisoned with him deep in the forest, Gwen and her fellow captives are at the mercy of a treacherous beauty on a mission of her own. Contending with her schemes—and a love potion gone awry—they must find a way past enchanted guardians, who are capable of crushing not only their bodies but also their dreams. 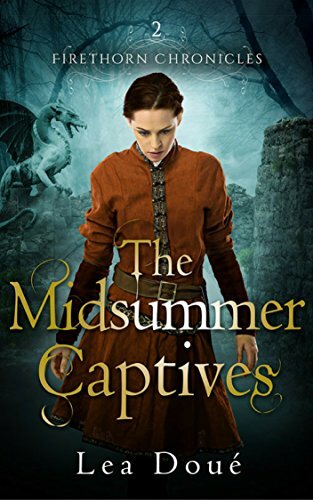 The Midsummer Captives, inspired by Shakespeare's A Midsummer Night's Dream, is the second novel in The Firethorn Chronicles, a series drawn from fairy tales and other classic stories. Follow the sisters on their adventures in a land where sorcery is feared, women can rule, and dragons fly. I honestly felt this was better than the first book in the series. Getting away from the palace and all the other princesses upped the focus and it was easier to pin down the story ... plus to me Gwen is a more interesting character than Lily, better motivation, her conflicts felt natural to me, just generally a stronger girl. The story moves at a good clip and Sissi is dang creepy/weird. Honestly, she's the Lady Gaga of the fantasy fashion world and I was just sitting there waiting for her to show up wearing a meat dress ... which she didn't, but she came pretty dang close a couple of times. There was one "shout at the characters for being stupid" moment but the character figured it out like two pages later and I was like, "Good, now I don't have to hate you." I'm excited to see where the other princesses end up. maybe a film version? Shakespeare is meant to be performed, not read, and I think it loses something without actors. Though there's always the Charles and Mary Lamb version which was my first introduction.